Various locations. $3.50 for a 12 oz. cup. Listed in French as “Chaud Chocolat,” this hot chocolate order at Amelie’s French Bakery isn’t too sweet — it’s just the right amount of bittersweet. It is made from a ganache (a paste of chocolate and cream) and topped with a delightfully creamy dollop of whipped cream. You can even add house-made syrups in a variety of flavors to switch things up. 514 E 36th St. $2.50 for a 12 oz. cup. The first time I ever went to Smelly Cat, they were running a promotion: spend $50, get a free tote bag. Naturally, I made a $100 purchase and got two free tote bags. This was worth it for a couple reasons: first, I now have two tote bags that I carry with me wherever I go, and second, I got to drink my fill of Smelly Cat’s delicious, slightly bitter hot chocolate, which comes topped with plenty of froth. 719 Louise Ave. and 1700 Camden Rd. #101. $3.35 for a 16 oz. cup. The white chocolate softens the flavor of this festive beverage so that it tastes almost like you’re eating a sugar cookie fresh out of the oven. It’s wonderfully warm and sweet enough (with enough vanilla foam on top) that you don’t even need to ask for whipped cream. 5126 Park Rd, Suite 1D. $2.99 for a 16 oz. cup. My penchant for being late developed in middle school, when my dad would regularly let me skip my first class and take me to Mugs instead. 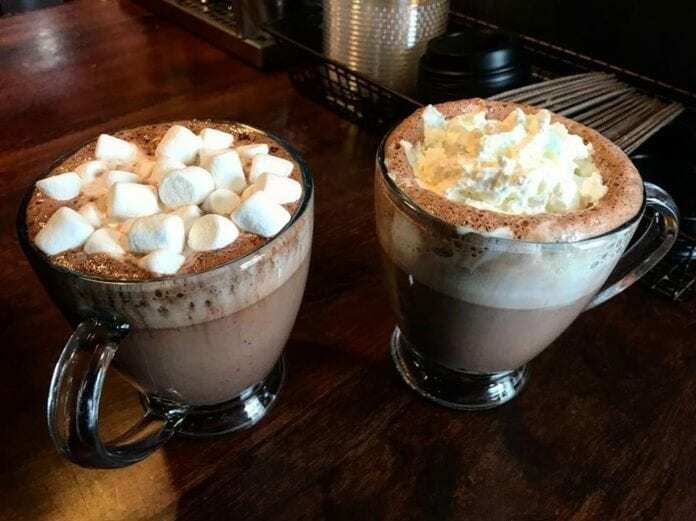 But if you’ve tried the hot chocolate here, you can’t blame us. It’s light and milky, with a slightly bitter chocolate taste that pairs perfectly with the double chocolate muffins. This hot chocolate isn’t just delicious, it’s also gorgeous thanks to a pretty rosetta carefully poured on top. I asked what sorcery makes this cocoa so thick and creamy, and was informed that proper heating techniques introduce steam to the milk, giving it an extra-rich texture. It’s not cloyingly sweet, it’s not too hot — it’s exactly what you want to give you those warm-fuzzies on a winter day. 1311 Chesnut Ln. and 13645 Providence Rd. $1.99 for a 12 oz. cup. Drinking this hot chocolate tastes like drinking a huge melted marshmallow dunked in chocolate. It’s a magnificent experience. Just don’t confuse Poppyseeds with Poppy’s, another bagel shop on Providence! 7416 Waverly Walk Ave., Suite H3. $3.35 for a 12 oz. cup. The newly opened Café Moka is the stuff of dreams, with an entire hot chocolate section on the menu. The Dark Chocolate hot chocolate (as opposed to the regular) really stood out. It’s slightly bitter but still a bit sweet –and topped with whipped cream, mini marshmallows, chocolate drizzle and graham crackers. Next time, I think I’ll try the Mexican Spice hot chocolate. Various locations. $2 for a 12 oz. cup. I was late to the game when it comes to the café built into Whole Foods. For an unknown reason, although I drink all and any hot chocolate (see: drinking melted chocolate), I turned my nose up at grocery store hot chocolate. I was sorely mistaken. The Whole Foods hot chocolate is light, sweet and milky, with a chocolate-y taste that’s not too overbearing. 214 N Church St. $12. People who say hot chocolate is a children’s drink are just wrong, but the Daily’s Mexican Mocha proves that. Made with Mezcal, homemade cayenne cocoa syrup and local coffee, then topped with fresh cream and star anise, this drink does not mess around. This post originally appeared on CharlotteFive.com.